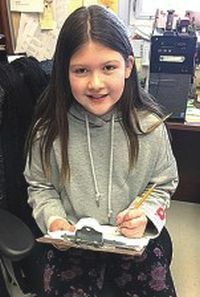 Janessa Burlock reports the news this week from Joussard School. Hello, this is Janessa once again, bringing you our news. In Kindergarten, our students reported they are learning how to mix colours. This is very interesting and they are learning how the different colours are created. The kids also let me know they are playing Duck Duck Goose in P.E. and that this is lots of fun. Our students in Grade 1 continue to do research and then write about what they have learned. In the last week they researched Daddy Long Leg spiders and learned lots of great information about these critters. The students also informed me that they invented a game in P.E. called Night Tag and that it is lots of fun. Students in Grade 2 are still learning about temperature and liquids. To see for themselves the relationship between ice and heat, they told me they melted ice cubes in their hands. They also reported they are doing word problems and 3-digit addiction in Math. The students in Grade 3 are getting very familiar with 3-digit numbers in Math. Using base 10 blocks, they are making visual numbers and then adding these together. They are getting pretty good at this. They also have a very unique form of tag to play in P.E. called Bear Tag. In Grade 4, our students reported they are learning to round numbers in Math. In Science, they are continuing to work on the cars that they built. They have discovered for themselves that axles are essential to getting wheels to move. Our Grade 5 students are off to Sucker Creek once again to learn from the land. The students love these experiences and learn so much. This time they are learning all about winter survival – they will learn to build fires and to create outdoor shelters. Hopefully we’ll have some great pictures next week. And, in Grade 6, our students are learning all about flight – comparing birds and airplanes and how they fly the same and differently. The students were excited as their teacher dressed up as a museum worker to do a presentation on raptors and other dinosaurs. Lots of fun while learning! 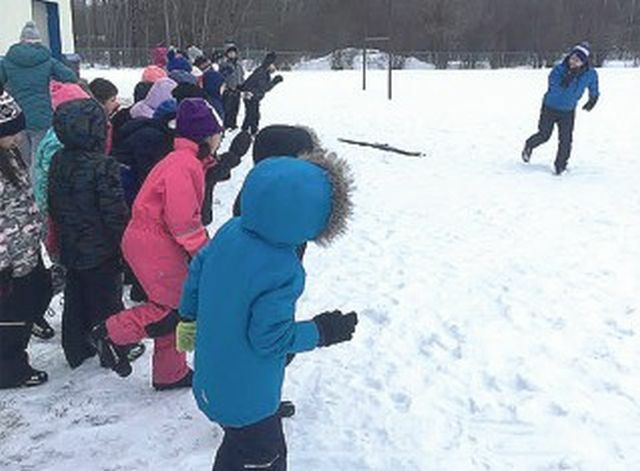 All of our students had an opportunity to learn cross-country skiing this week, as Hans Bjorkman of Spirit North came to our school to teach us this skill. It was a pretty chilly day, but everyone warmed up when they got active. Thanks for reading my report. I’ll be back next week. 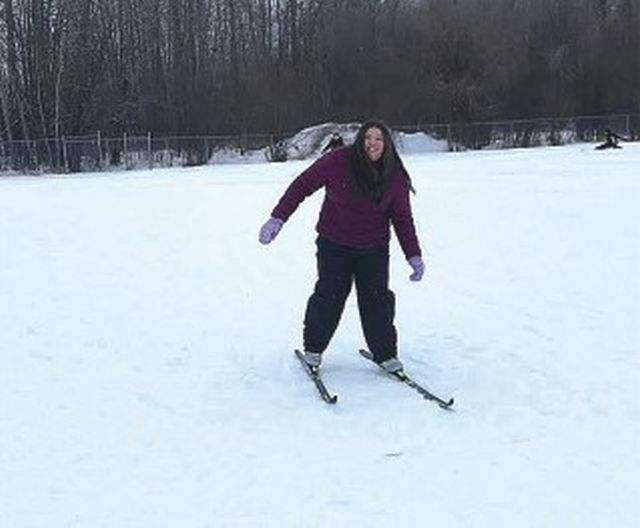 Jewel Burlock beams, as she catches on to cross-country skiing. Hans Bjorkman of Spirit North, teaches some eager learners how to cross-country ski.